In the acting world you shy away from preforming with children and animals. Why...because there is nothing worse than being upstaged by cuteness -- after all those years of distilling your experiences into being spontaneous and natural in front of an audience. 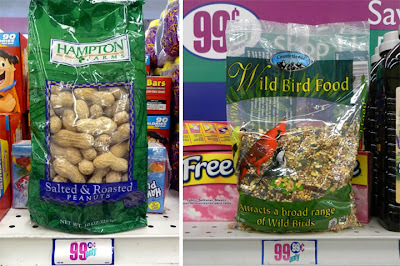 In The 99 Cent Chef's latest video you'll see what I mean watching birds and squirrels upstage the Anthropomorphic Chef. My neighbor feeds the birds and squirrels every morning. So I got the idea to set out some seeds and have them do the work of making an opening title sequence for me. Only a nut would let squirrels and birds do the typography for my videos...well, I'm that chintzy nut. And my front yard critters will work for 99 cent peanuts and birdseed. For the final video scene it's a squirrel feeding frenzy when the The Doctor. 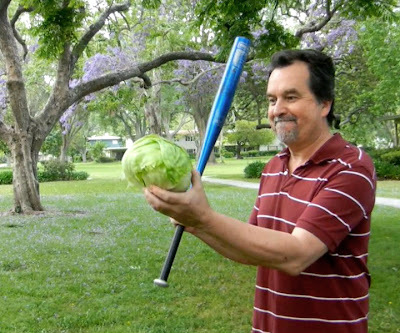 Doolittle of chefs scatters lettuce in the most unique way for the tree dwelling rodents. It's all in the wrist, if you want to compost like The 99 Cent Chef. With shovel in hand the Chintzy Composter shows you a simple method that reduces the garbage you throw away by about half - so that means less trips to the dumpster. Plus, if you have a small garden you will never have to buy potting soil again. Just scroll to the end of this post for my Composting Video. There are many techniques for Composting. Just Google the word and you'll see what I mean. It really just depends how much you want to deal with. You can start a giant compost pile with everything from veggie table scraps to lawn trimmings, and even newsprint and paper. 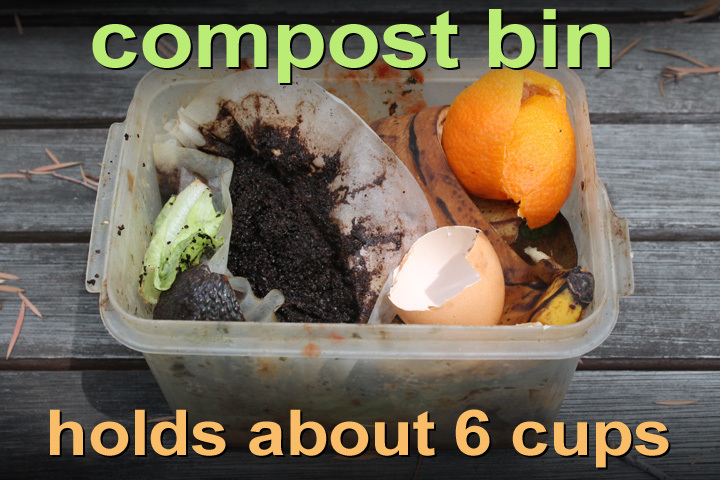 I live in the city, so composting is best not seen or smelt! In my household of two, I've come up with an easy-to-do method. Every day my wife and I collect the veggie and fruit scraps, coffee grounds, and egg shells into a small container with a top. I live in a condo complex with a lot of land per unit and there is an outdoor common area in the corner that is not used. 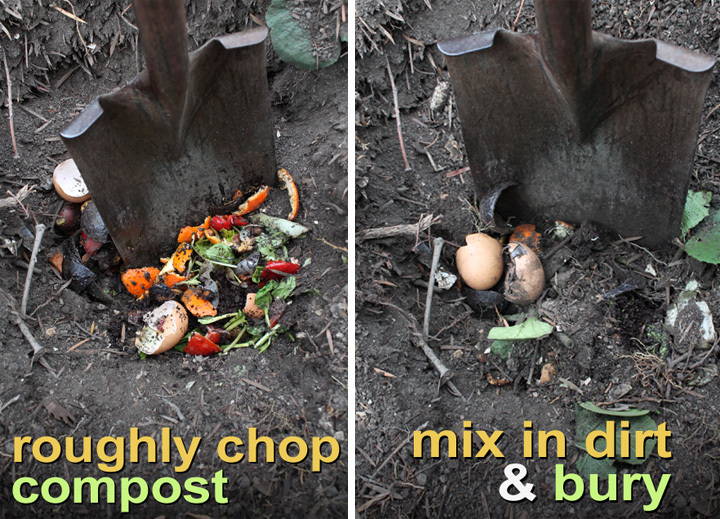 So every 2 to 4 days I take my full compost bin and bury the scraps in a 4 by 4 foot square area. Nobody complains and some of my neighbors offer encouragement and even compliments. With a minimal amount of compost area to work with, I find it's just enough. I bury my small scrap amounts, and a couple of days later dig a new hole. If you roughly chop up the scraps with the shovel and mix in a little dirt, the decomposition is complete in less than 2 weeks. So by the time I've filled my 4 food square, it's ready for a new round of veggie scraps. 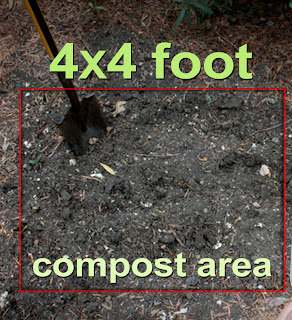 (You'll see black nutrient-rich looking compost clumps as you work your way around.) It takes about 6 months until the compost is ready for my garden -- just in time for Fall and Spring planting. A quick gardening note: composting veggies with seeds, like cucumbers, squash and tomatoes, means you will get sprouting seedlings popping out all over. I'll prune out most of them as they come up, but I like to keep a few plants just to see how they do. Every year I get some type of squash plant that yields a bouquet of edible squash blossoms -- just type "squash blossoms" into the "Enter Ingredient or Recipe Keyword(s)" search window located at the top right side of this page to see all the recipes I use them for. The trick is to keep the compost area clean and odorless. Instead of a smelly compost pile, I bury mine. Now, that means I can't compost everything, but it's good enough for big city living. 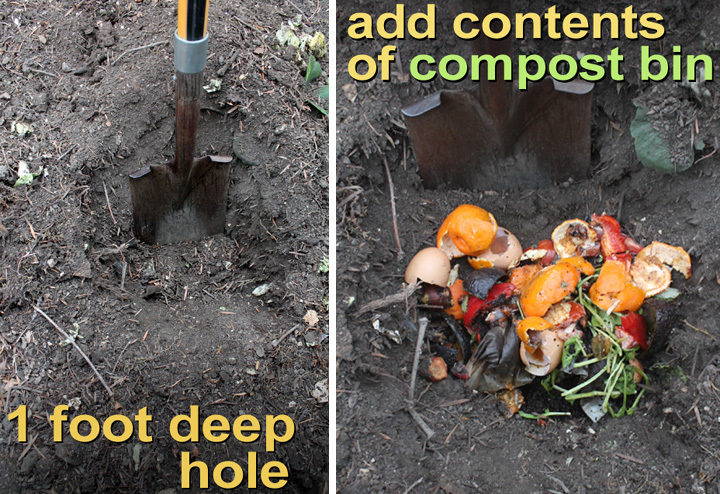 So, check out my Composting with The 99 Cent Chef video below. As I mentioned earlier, "It's all in the wrist," and I don't just mean how you handle a shovel, as you will see during the video's outrageous ending. Play it here, video runs 3 minutes, 17 seconds. And 99 thanks to Pete Handelman, Bob McGuinness and Amy for shooting the Chef. 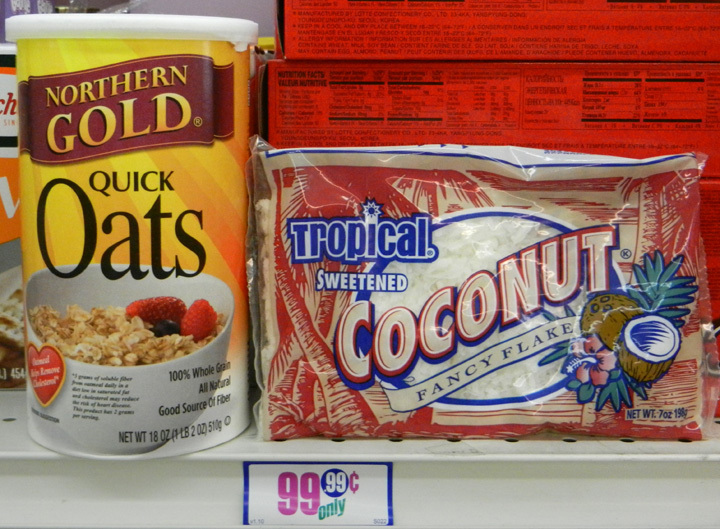 Take a vacation from your typical boring breakfast and try out The 99 Cent Chef's exotic Coconut Oatmeal. I've added raisins, chopped apple and banana before, but spying an old bag of coconut flakes in the refrigerator door shelf, I knew right away it would pair perfectly with simmering oatmeal. You can't have a cheaper breakfast than a hot bowl of oatmeal. And I've been seeing plastic bags of coconut flakes at my local 99c only Stores lately. Even if you have to buy it a full price, you will get many Coconut Oatmeal breakfasts out of it. And if you've made my Coconut Crusted Fish & Mango Salsa recipe (click here to check it out) then my new oatmeal recipe will use up any copra leftovers. Coconut flakes helps the roughage go down. And my recipe couldn't be easier to make. 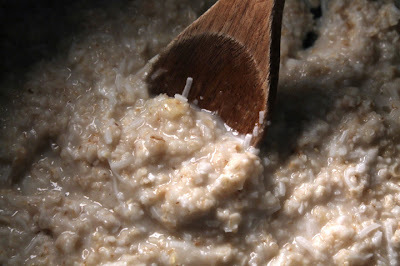 Oatmeal comes many ways, from instant and quick, to steel cut. Just follow the package directions and add some coconut flakes when you start it. 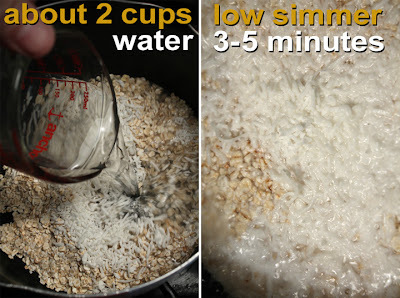 You could even add a spoonful to your single serving of packaged oatmeal for the microwave. So kick up your oatmeal breakfast with The Chintzy Chef's tropical Coconut Oatmeal, it's a cheap and delicious taste of paradise. 1 cup oatmeal - any type, but make sure to follow package directions. My directions below are for "quick" oats. 1/4 cup of shredded coconut - or coconut flakes. I used sweetened coconut, so no sweetener was needed. 2 cups of water - okay to use milk. 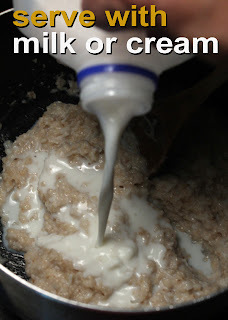 I like to use water and add a little milk (a couple tablespoons) just before serving. You can also use your favorite dairy substitute. A pat of butter - optional. Add when serving. 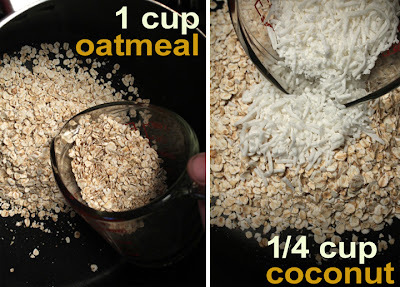 Simple to do, just add oatmeal, coconut and water to a pot. 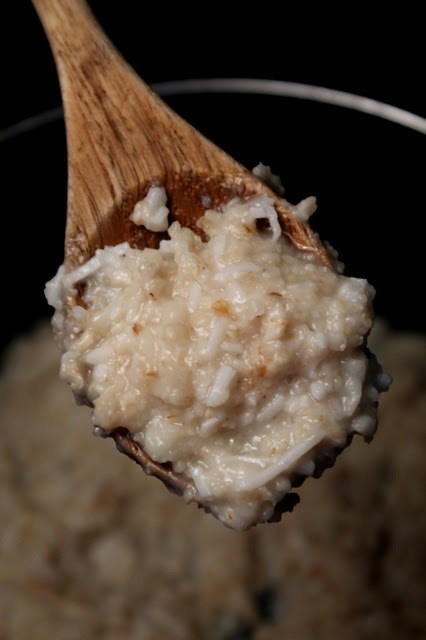 Cover and low simmer until oatmeal is soft. Cooking time may vary according to the type of oatmeal you use. I used "quick" oatmeal, so it only takes 3-5 minutes. Dried coconut flakes will reconstitute and be tender when simmered with oatmeal. I used sweetened coconut, so no sugar or honey was needed. If you have unsweetened coconut then you may need to add a favorite sweetener. I like to finish up my oatmeal with a splash of milk and a pat of butter. Simply half the recipe, for a single serving. Add or subtract coconut flakes in my recipe to suit your taste. 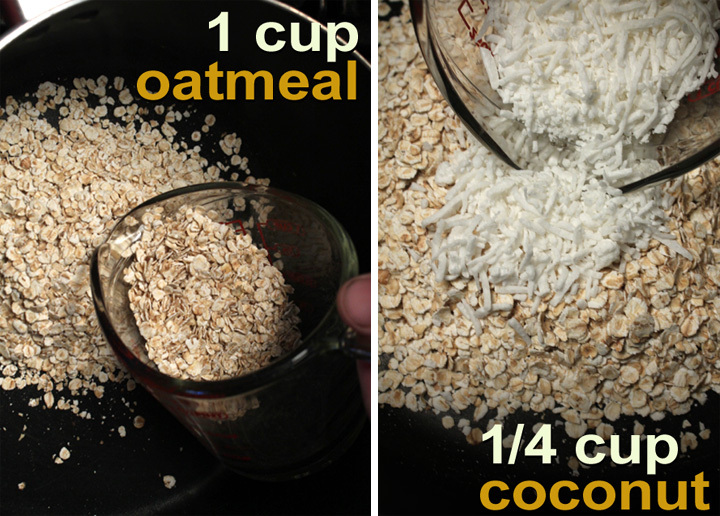 If the coconut flakes have been drying out in the refrigerator for too long you can simmer some in water for a minute before adding oatmeal. Other goodies to add to your oatmeal include: some chopped apple, blueberries, strawberries (or almost any berry,) sliced banana, and dried nuts, pineapple, raisins or cranberries. Again cooking oats varies by type. Instant is the quickest, while steel cut takes the longest, anywhere from two to ten minutes. Best to check the package directions. Fire up the backyard grill and let's get cooking with The 99 Cent Chef. 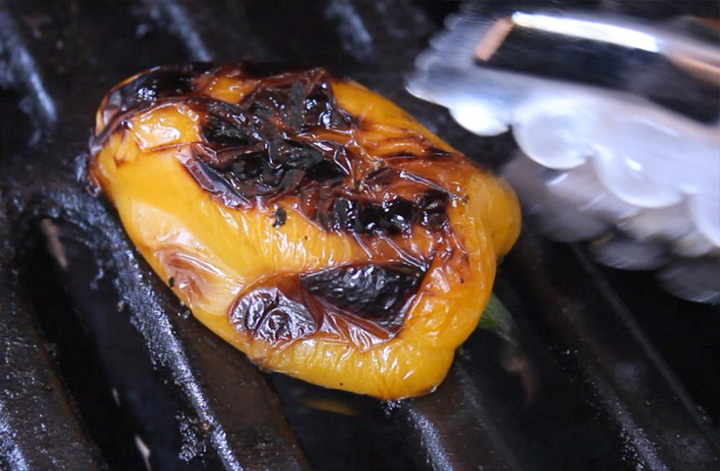 My summertime stop motion animated video series features a kaleidoscopic selection of grilled veggie recipes. With fresh summer produce stacked in roadside fruit and vegetable stands, local farmers markets and regular grocery stores, this Frugal Forager is buying canvas bags full -- and cheaply too. 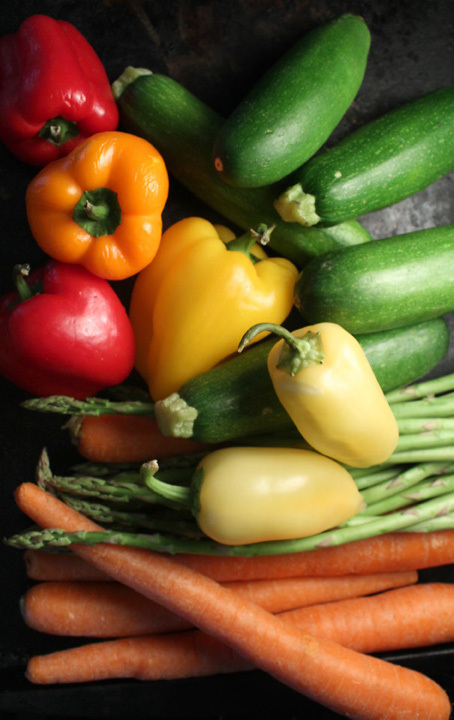 Some of the veggie recipes that will be featured in my warm weather grilling video series are: Curry Carrots, Italian Squash with Fresh Herbs, and Spicy California Chile Peppers. So do keep checking back all summer! I'm starting off simply with Grilled Bell Peppers. It's my favorite way to cook them. First slice in half and take out the seeds, then just rub or brush on some olive oil and season with salt and pepper. And finally cook them 5 - 10 minutes on your backyard grill. This sweetens them considerably. I have a cheap gas grill, so it's easy to keep track of how long it takes to cook veggies thoroughly. If you have a charcoal or wood burning grill the cooking time will vary according to how intense the fire is, and you will have to watch things closely. What you are looking for is a medium brown, to black, blistered char and for the Bell Peppers to soften. The Grilled Bell Peppers will continue to steam and soften after removal from the fire. And you can easily peel off the most blackened skin parts, if you like. Me, I like some of that charred flavor. You can adapt this recipe for indoor cooking. I like to broil them in the oven, too. Just check on them every minute or so. You lose some of the smokiness, but the sweetness still comes through. 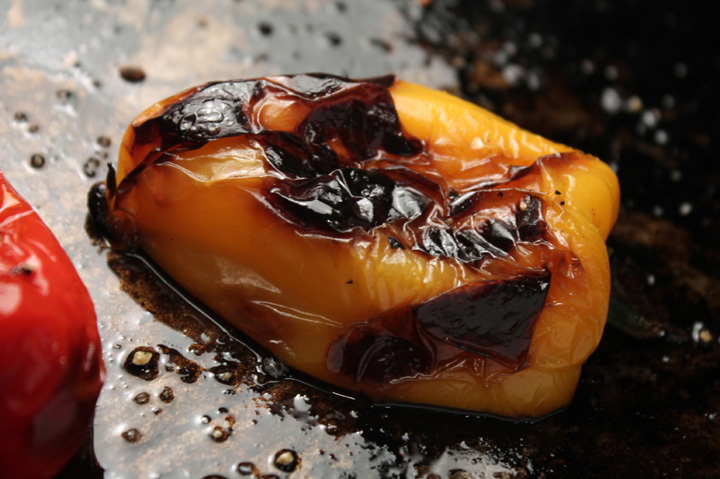 You could even roast the Bell Peppers in the oven, especially if you are baking a chicken; it takes about the same amount of time -- just pull them out after they collapse and start to blacken. And be sure to cook plenty. 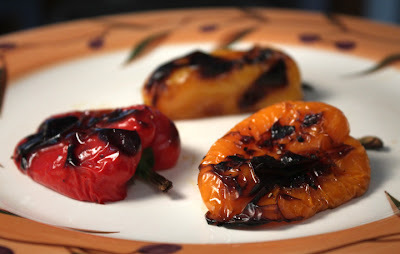 Grilled Bell Peppers make a low calorie side dish and can easily be reheated anytime. Pull them out of storage from the refrigerator and zap them in the microwave for 30 seconds or so - they add warm heft to your favorite salad. When I'm grilling protein, bell peppers are a nice lighter contrast to typical heavy sides like potato salad or french fries. My Grilled Bell Peppers recipe works with almost any crisp veggies like: ears of corn, thick slices of cauliflower and eggplant, broccoli florets, whole carrots, halved yellow neck squash, onion slices (or whole green onions,) and spears of asparagus. If you've never put vegetables alongside that summertime barbequing burger, hot dog or chicken leg, now is the time to start. And you can't do better, or easier, than the Green Thumbed Chef's Grilled Bell Peppers. Play it here, video runs 2 minutes, 12 seconds. 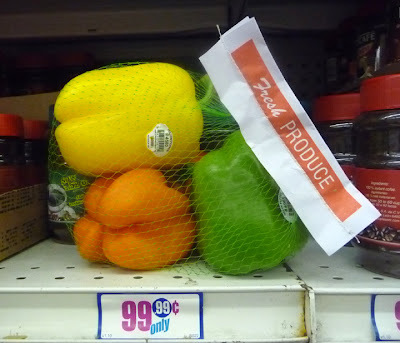 2-4 Bell Peppers - any color on sale, including: green, red, yellow or orange. 2 teaspoons of olive oil - or your favorite cooking spray. Use as little as you want. 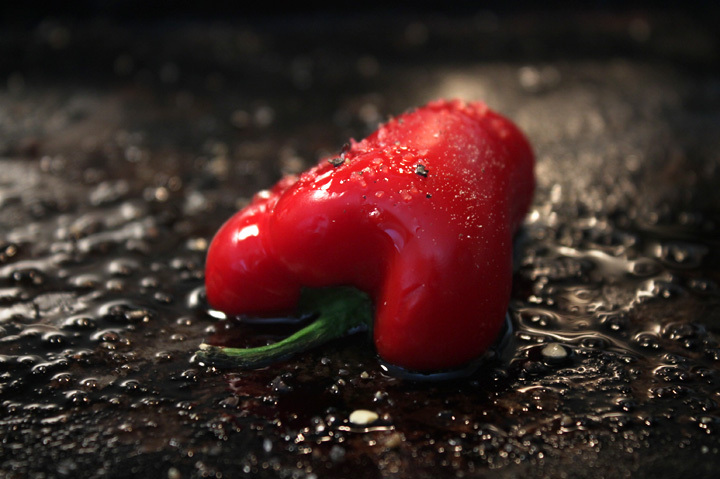 It's okay to brush (or rub) on oil for a light coating, on the outside of the bell pepper. If you are using a charcoal or wood burning outdoor grill then get it going first. 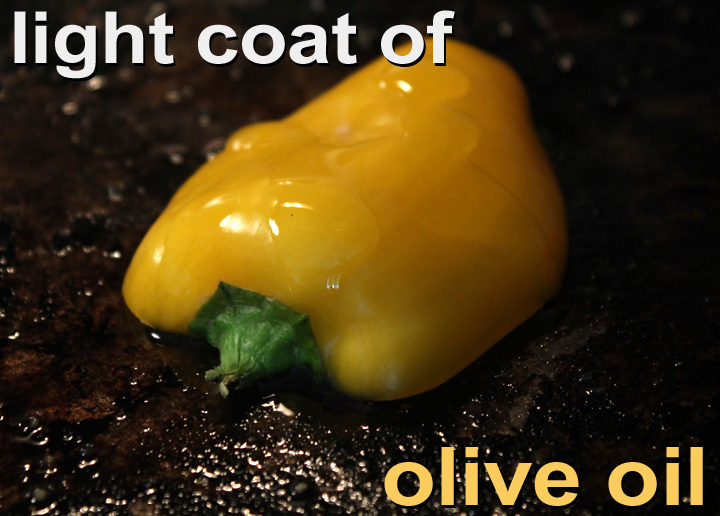 Lightly coat the shiny outer Bell Pepper halves with oil. You can just spray with oil or brush it on, or even use your fingers and rub on the oil. 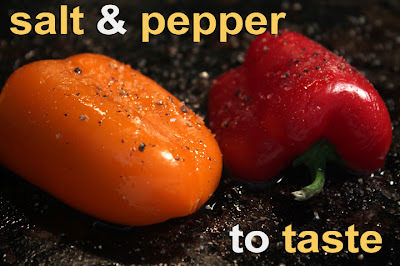 Finally, lightly sprinkle the Bell Peppers with salt and pepper to taste. Now time to grill the Bell Peppers. I have a cheap patio gas grill. I like to use a low/medium heat to control the charring. I usually cook the inside of the Bell Pepper first for 3-5 minutes until the edges blacken. 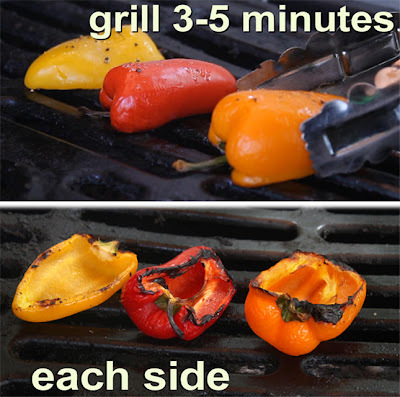 If you have a charcoal grill then keep the Bell Peppers closer to the outer edge of the fire for more control. You will have to babysit the veggies to keep them from becoming totally burnt. And remember, burnt spots actually have flavor. Ready to eat right off the grill. 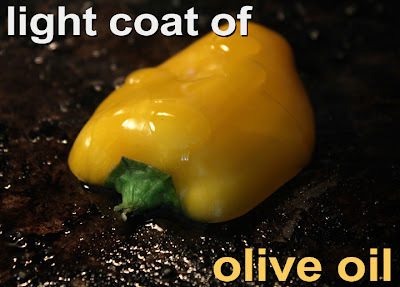 Simply coating a crunchy vegetable with olive oil, salt and pepper is a good way to practice backyard grilling. Once you've done it a few times, my grilling technique may become your default recipe. Shucked corn, whole carrots, yellow neck or Italian squash, and thick slices of cauliflower and eggplant work well with this recipe. For an indoor version, you can broil the Bell Peppers in the oven. Don't set the oven rack up against the heating element, it's too easy to smoke up the kitchen. It almost takes the same amount of time as a patio gas grill to cook the Bell Peppers. 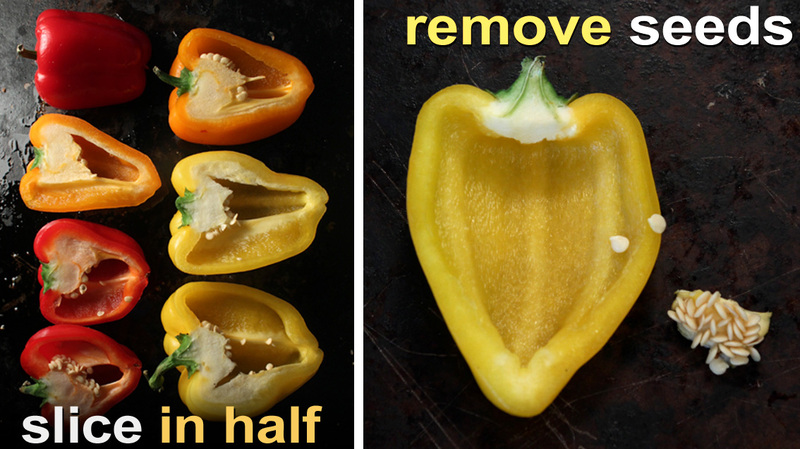 You could just simply roast the Bell Peppers in a 375 degree oven for about 30-45 minutes. Bake with the shiny outside skin up. When I roast a chicken I always like to fill up the other oven racks with a metal pan of foil-wrapped sweet or regular potatoes (may take an hour to cook through,) carrots and bell peppers. It's light and heavy, hot and cold, crunchy, succulent and tender -- this recipe has it all. There's nothing better for a meat eater than slicing into charred juicy protein, unencumbered by anything else, except maybe another heavy carb like mashed or fried potatoes. A grilled slab of medium rare steak with a cool crisp salad seems like a waste of bovine. Well I'm here to change your mind with a delicious entree that's so different than your everyday meat and potatoes -- A hearty Warm Steak Salad. Plopping down a sliced steak done your way on a salad shouldn't work, but curiously enough it all goes together. And it's easy to do and cheaply too if you have some cheapskate connections. I have a simple salad recipe that fits snugly under the steak and a Warm Salad Dressing to bring it all together. 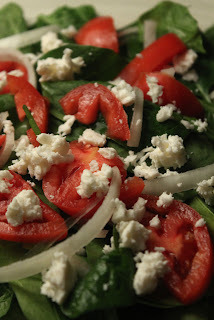 For the salad I combine greens, tomato, sliced onion and a little crumbled cheese. Of course you can make the salad any way you like it with the addition of fresh and seasonal farmers market veggies and greens. 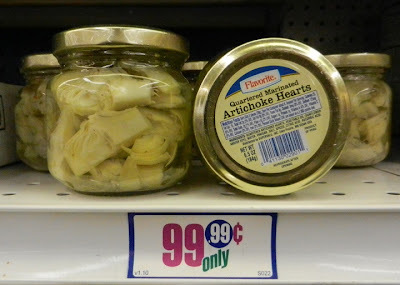 I also added a small jar of marinated artichoke hearts that always show up at my local 99c only Store. The Warm Salad Dressing is just oil and vinegar (actually the artichoke marinade) that's heated up in the same pan you fried the steak in. Just scrape up those tasty steak bits and mix it all together and pour it over the salad and steak. You can toss this meal together in no time and the flavor combinations will have you adding my Warm Steak Salad to your treasured home recipe list. 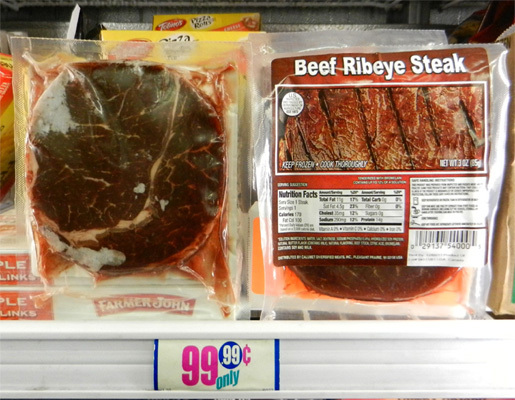 Beef steak fillet - I used a small 3 ounce thin-sliced Rib Eye steak for 99.99 cents. Greens - about 3 cups. More or less to your liking. 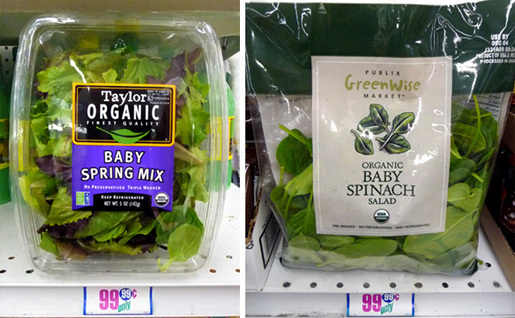 Any type of lettuce and/or spinach. 1 whole medium tomato - a couple of smaller Roma tomatoes, or a handful of Cherry tomatoes. A thin slice of onion - yellow, red or white. 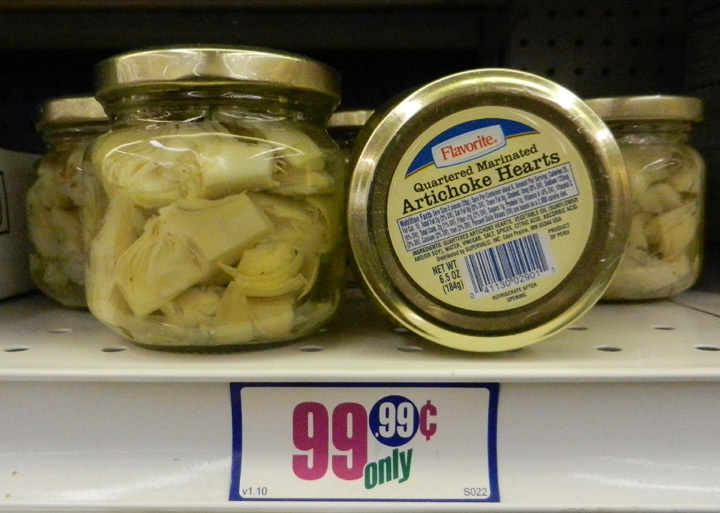 1 jar of marinated artichoke hearts - drain and set marinade aside. A favorite crumbled cheese - optional. I used a 1/4 cup of Mexican Queso Fresco. Blue cheese, or shredded mozzarella, cheddar, and fresh shaved parmesan are other options. Salt and pepper for the steak - to taste. 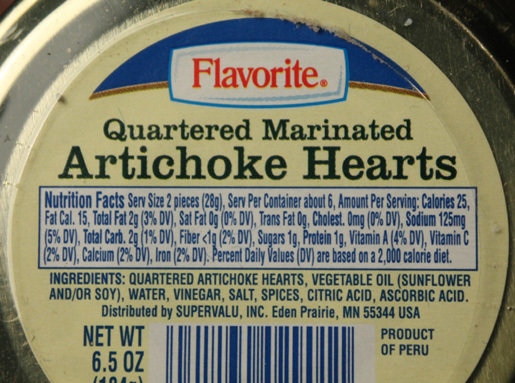 Other salad additions include: olives, avocado, sliced or shredded carrot, drained canned beets or beans, and pickled veggies like artichokes, heart of palm and roasted peppers. Also lightly steamed veggies:broccoli, cauliflower, corn and squash. 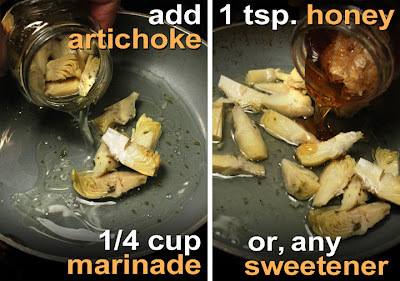 2 tablespoons each of olive oil and vinegar - I used 1/4 cup of the marinade from a jar of artichoke hearts (which contains oil and vinegar.) Okay to add more for a larger salad. 1 teaspoon of honey - or a small amount of your favorite sweetener. Shred lettuce or spinach leaves. 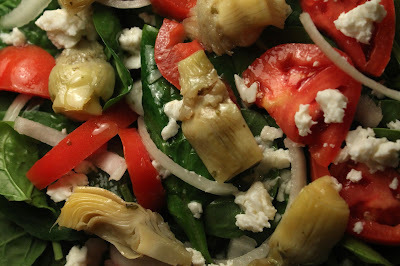 (Spinach leaves may be small enough to leave some of them whole.) Slice tomato and onions. Add to your serving plate or bowl, mixing lightly. Season then grill or pan fry the steak. Set aside. I've found with a thin steak all you need to do is cook one side until nice and browned, then flip it over and finish cooking for a few seconds more to desired doneness. Serve with the charred side showing. Quickly add a 1/4 cup of marinade (or plain oil and vinegar,) with artichoke hearts, to the steak pan over a medium/high heat. 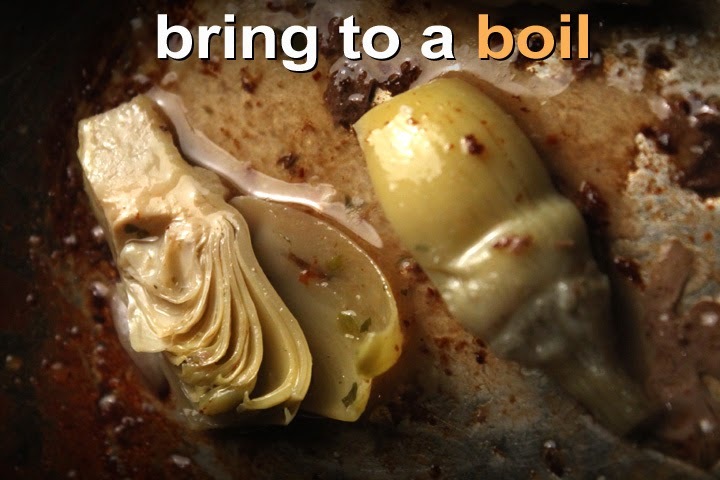 Loosen charred steak bits from pan and heat the liquid and artichoke hearts for a minute. When it starts to boil it's done. Turn off heat and add sweetener, mix well. Slice steak and pour half of the warm marinade over salad. Place steak on salad and sprinkle on cheese (optional) and the rest of the marinade. You can make this salad seasonal, so add any veggies or greens you like from the farmers market or your local grocery store. You can also lightly steam the more crunchy vegetables for a couple of minutes, or thin-slice and serve them raw. If you find canned or jarred veggies on sale just drain and add about 1/2 cup total. You can top with a handful of canned black olives, too. I used a thin-slice of Rib eye on sale for 99.99 cents. You can use any tender cuts including: sirloin, New York and tri-tip. There is no need to cook a large expensive fillet, your appetite will be filled with the salad. 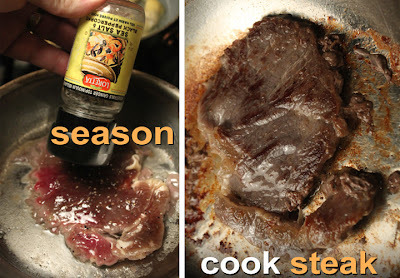 If you have to buy a large steak then slice into single servings, wrap and freeze it to make more Steak Salads later. 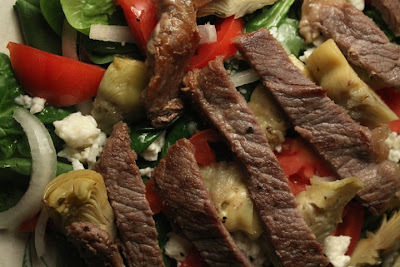 Or feed your meat eater companion the left over steak and enjoy your lighter Steak Salad. 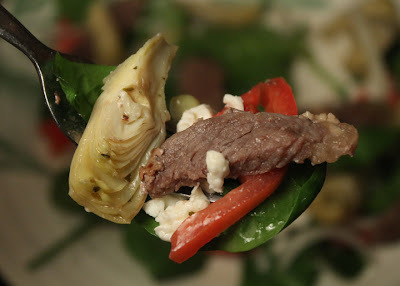 Adapt my Warm Steak Salad to suit you taste, mix and match any of the above ingredients. Of course, leave out the steak and you have a delish Warm Vegetarian Salad. This new series is a bunch of entertaining loose ends, first impressions, recipe tests, comedy sketches, fun outtakes, and video diary entries. Small Plates are just a few scraps that will eventually find their way into a full course video somewhere down the cooking line. The Cinematic Chef is improvisational by nature and sometimes it takes a while to figure out what to do with all my disparate culinary concepts. The Video Small Plates series is just an appetizer. My blogposts can be over-stuffed with ad nauseam recipe prose, too many photos, long videos and jittery gifs. Your are now entering my culinary zen garden. And it's just fun to make a simply shot video. Hopefully this video series will whet your appetite and keep you coming back for more of my easy to digest food antics. Play it here, video runs 41 seconds. 99 thanks to Pete Handleman for his camerawork.